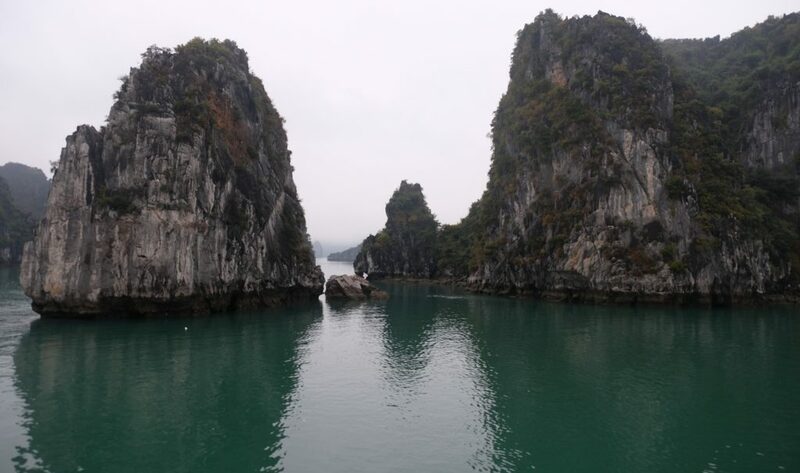 Ha Long Bay, Bai Tu Long – descending dragon bay! 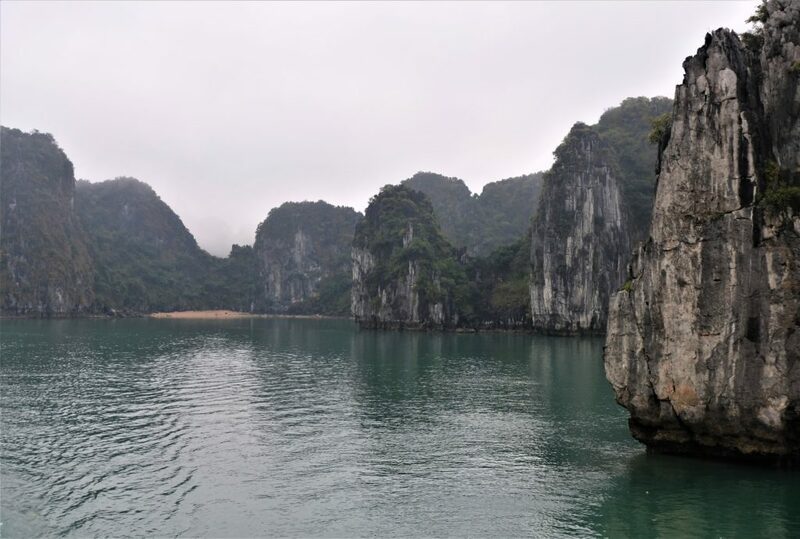 My destination was Ha Long Bay for a three-day cruise, starting in Ha Long Bay then heading on to Bai Tu Long. I did quite a lot of research into the cruises because there are a lot of suppliers offering similar. 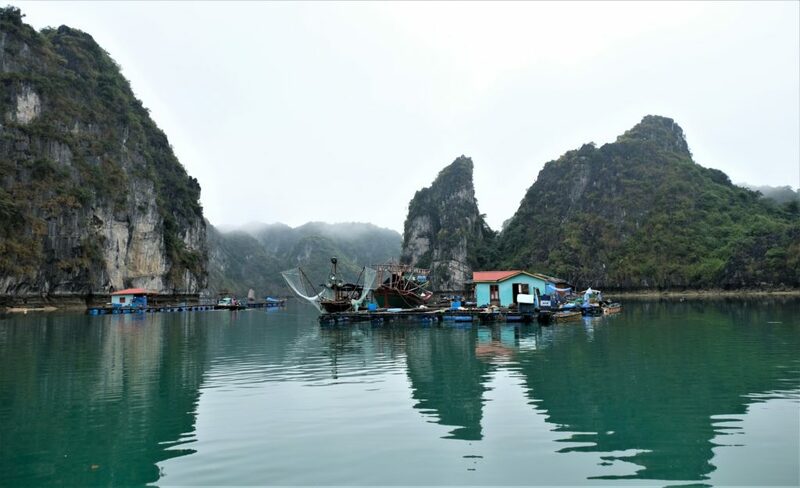 After speaking to a few people especially the owner of my homestay in Hanoi (irritates me that I cannot remember her name and forgot to write it down), it was recommended to find a cruise that goes to Bai Tu Long. 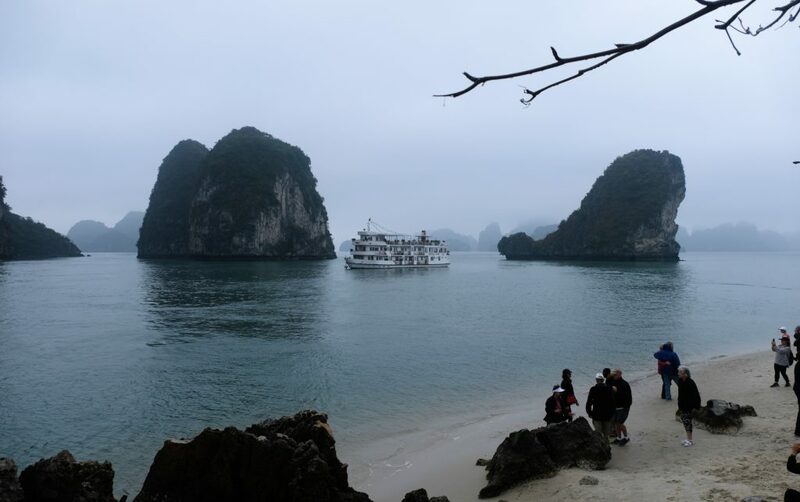 Ha Long Bay is very crowded with ships and the water is murky and polluted, Cat Ba was another option but seemed more like a holiday resort type of destination. 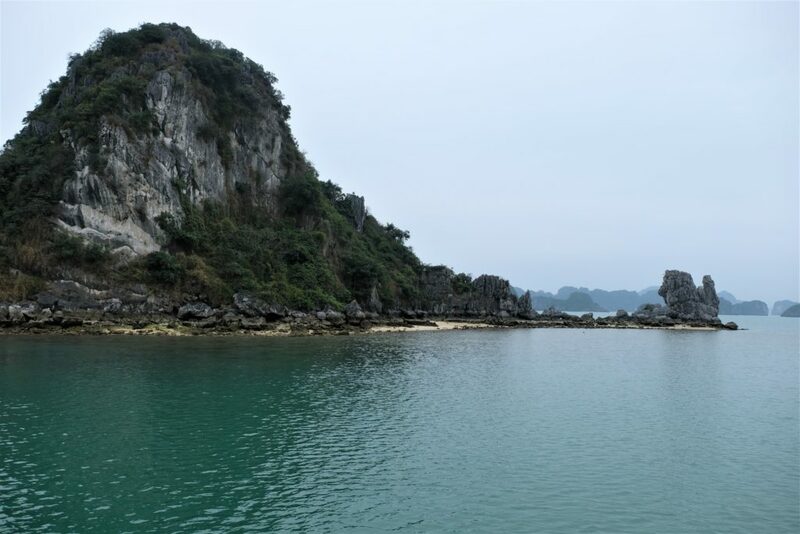 Ha Long Bay, Bai Tu Long and Cat Ba are all part of Bai Tu Long National Park. 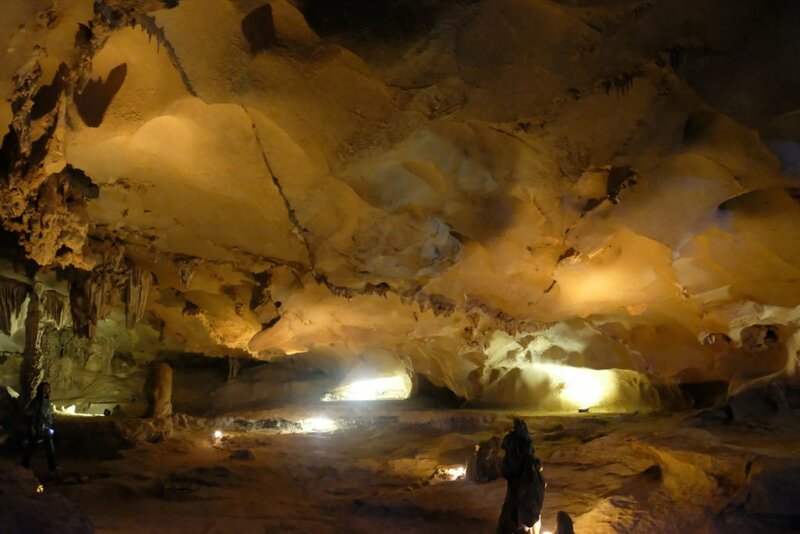 All excursions, kayaking, cave visits etc. A murky early start to the morning in Hanoi I was collected from my hotel, Julie and Mila had already been picked up along with about 10 other people – a spacious small bus in good nick. Julie and Mila had arrived back from the North the night before but were ill, especially Mila who had a bad fever. It took little convincing for Julie to convince our guide to stop at a pharmacy somewhere along the way to get something for her (Julie by the way is a pharmacist) – we left Hanoi before most of the shops were open. 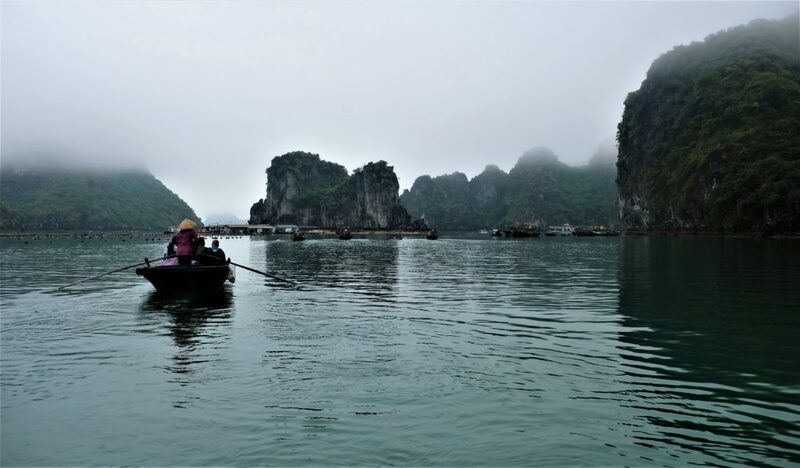 Ha Long Bay isn’t far from Hanoi, less than 200km, but a combination of traffic, road conditions and speed limits mean it takes close to 4 hours to get there. The landscape is very flat and wet with rice fields filling the gaps between the residential areas. It’s easy to identify which are official government buildings, their style distinct, well-kept and adorned with flags….not like the other buildings which have a neglected appearance, likely more so a lack of resources to maintain them and not out of the will of the occupants. A little over halfway into our journey we stopped at what could only be described as some sort of government built roadside stop, only for tourists. Outside of the main building is full of stone carvings for sale, but you cannot take photos of them, why I have no idea. Inside the building is a very large store/shop selling Western sweets, snacks amongst local produce, the place is very clean, but extremely expensive – converting back into Pounds things were twice the price, wine was near three times the price you would pay in London. 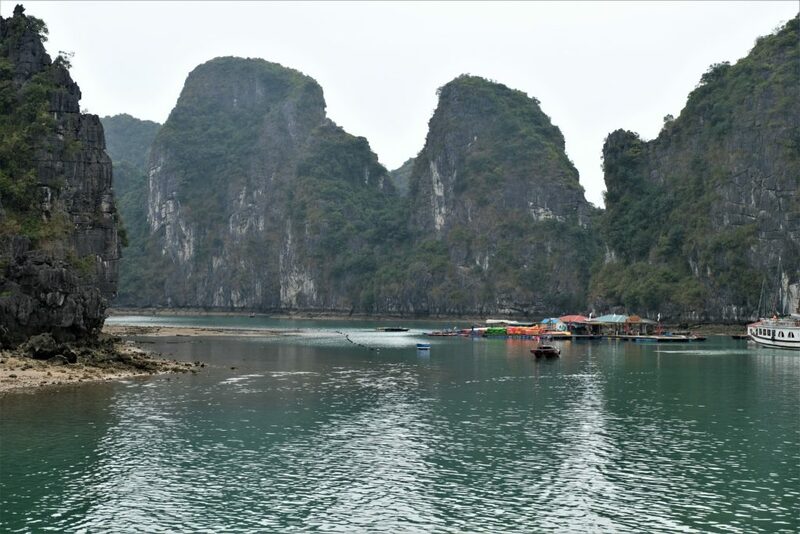 We were within earshot of Ha Long Bay, near the many ports around Bai Chay Bridge, a very impressive kilometre long cable-stay bridge located at the beginning of Ha Long Bay. Crossing the bridge from West to East a large dated red ferris wheel stands on the right on top of a hill that overlooks the bay. It seemed out of place, a random place to have one, the views from there must be quite spectacular…not today with low misty clouds handing over the bay as far as the eye could see. 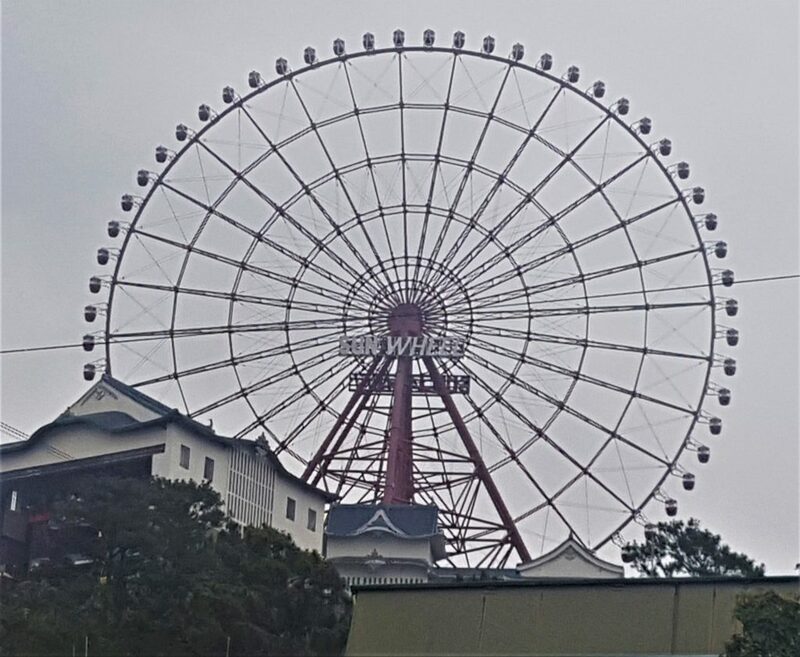 Even so, I still thought what an odd place to have such a big ferris wheel – I know there is an amusement park on the other side of the bridge. 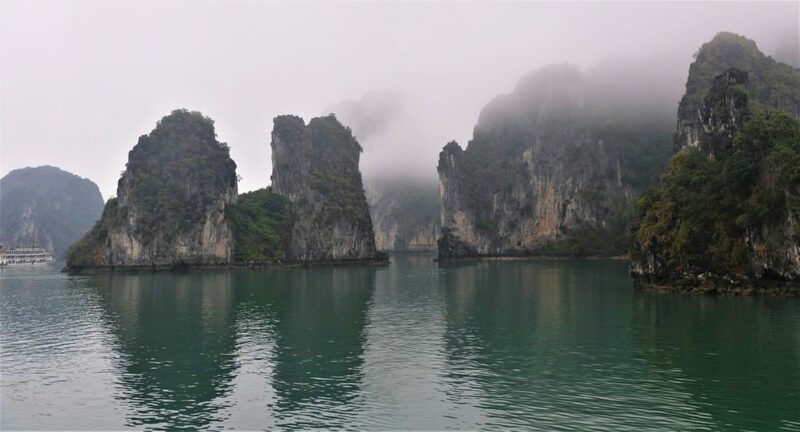 Jumping back to the beginning of this post, we chose Cristina Diamond Cruise in the end, at the port we disembarked from the bus at Hon Gai Harbour onto a type of longboat, very similar to one I went on at Khao Sok National Park only wider and people sit around the edge. Hmmm, so I guess not like a longboat at all ?! Our boat, aptly name Cristina Cruise was pleasantly surprising, very nice indeed! Now, for some or other reason I can’t find photos of my room, I’m sure I took some, grrrr guess not! Oh well, a double bed, on-suite with an awesome shower, air conditioning and a balcony too! Having left the overcrowded Hon Gai International harbour and checked into our rooms it was time for lunch. I’m sometimes sceptical on “all inclusive” deals because you never know what you are going to get when it comes to food. Well, they certainly did not disappoint! Each table seats 4 or 6 and my oh my do they pile on the food! As soon as you think the meal is done they bring another dish, then another and another….delicious food! Tummy full, it was time for our first excursion, the pearl farm Vung Vieng village, a floating village. 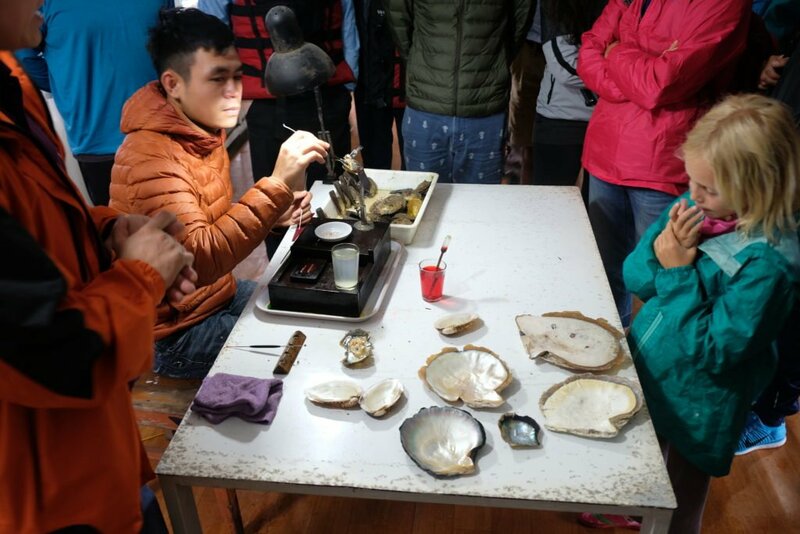 I had not idea what to expect from a pearl farm, other than I was going to see some pearls. The pearl farm is interesting, we got there by transferring onto a smaller boat which took around 20 minutes to get there. At the farm they showed us the different types of pearls black, white, cream and green (I think those where all the colours). It was interesting but what I was astonished about was that they have at most a 10% yield, the 90% are either duds or no pearl is formed, that’s bloody low! No wonder what was for sale was so bloody expensive; I wanted to buy a black pearl, nothing to big and for no other reason than just to have one, at $350 I decided not to! 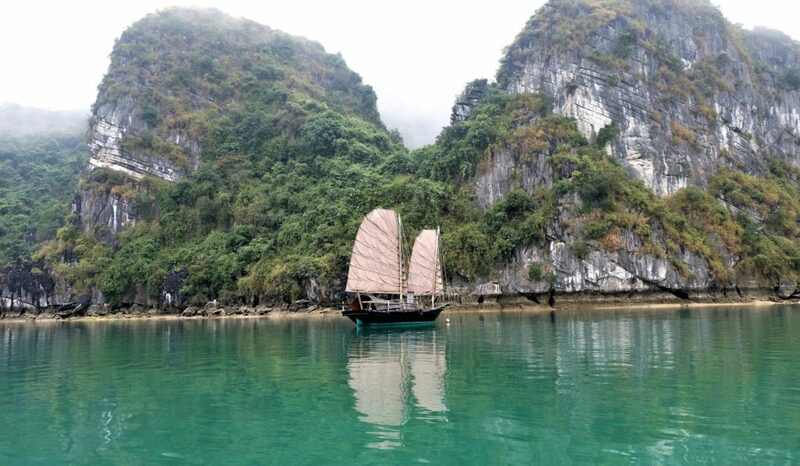 For me the best part of this excursion was after the pearl farm, a bamboo boat trip around Vung Vieng village. Each boat takes 4 passengers and all the boats are rowed by a single woman. I’ve never been in a rowing boat where the strokes are near silent, the technique they use standing up is very unique with the power stroke a pushing movement. You can almost not hear the oars leaving and re-entering the water as we glided across the still mirror like water. 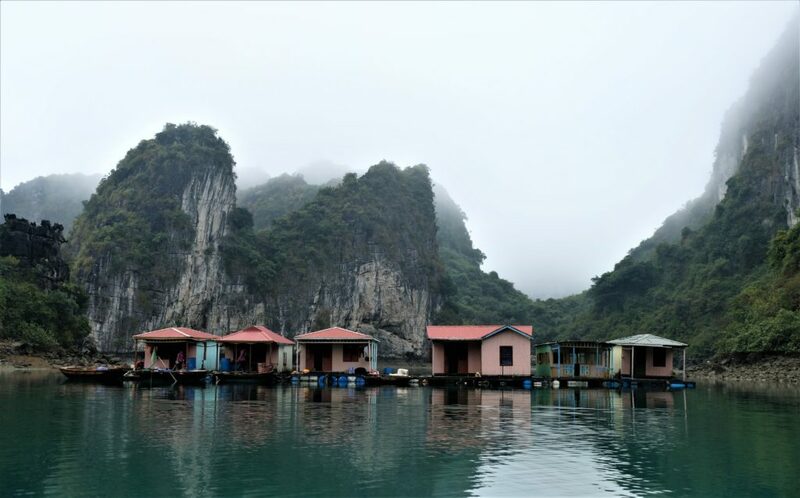 The village itself is a floating village, although technically the inhabitants are Vietnamese they are self-sufficient; to the extent that the government has made it more difficult for them over the years as a means to incorporate them into the rest of the country. The rest of the days was very much relaxing back on the boat, there was the option of going kayaking &/or visiting the beach, but I along with everyone else wasn’t keen to sit on a beach in a drizzle and rather chilly overcast afternoon. We cruised to Cong Dong area where we would anchor down for the night….as do so many other cruise boats! We did try and attempt to do some squid fishing not very successful though ? I had mentioned earlier that Mila wasn’t looking nor feeling well, the next morning she seemed worse, so Julie and Mila decided to stay on the boat and get some rest. The rest of us headed off on the day boat to visit the Master Cave (Thay cave), not a big cave and to be honest it was ok – it was only a short distance away and the trip there and back was done and dusted in less than an hour. Back to the cruise boat where people doing the 2 day cruise left leaving only 6 of us. After lunch, 4 of us (not Julie and Mila) headed off for some kayaking around the Vung Ha area. Off onto another day boat, much bigger this time with an indoor area too (we would be thankful for it later). The kayaking was nice, the landscape surrounding the area was striking! Barely a ripple in the water and no wind, the only sounds to be heard were our paddles in the water. What stuck out to me was the lack of marine life, nothing, not even a little fish. 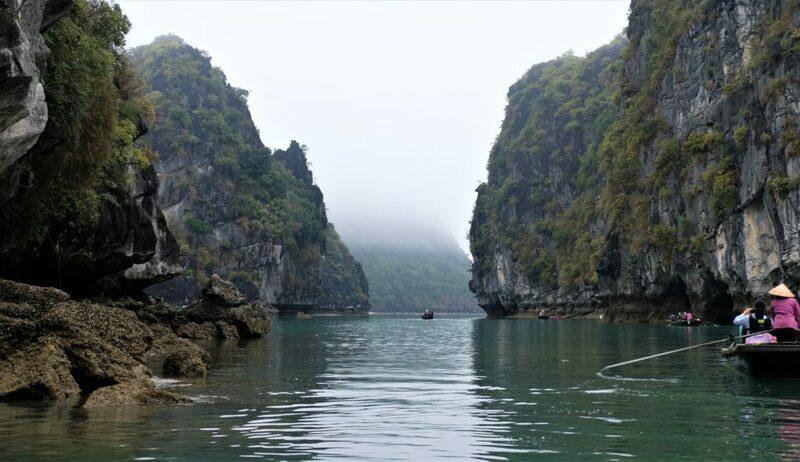 Our destination was another cave about 45 minutes of steady paddling away between numerous jagged stone islands with speckles of deep green vegetation. 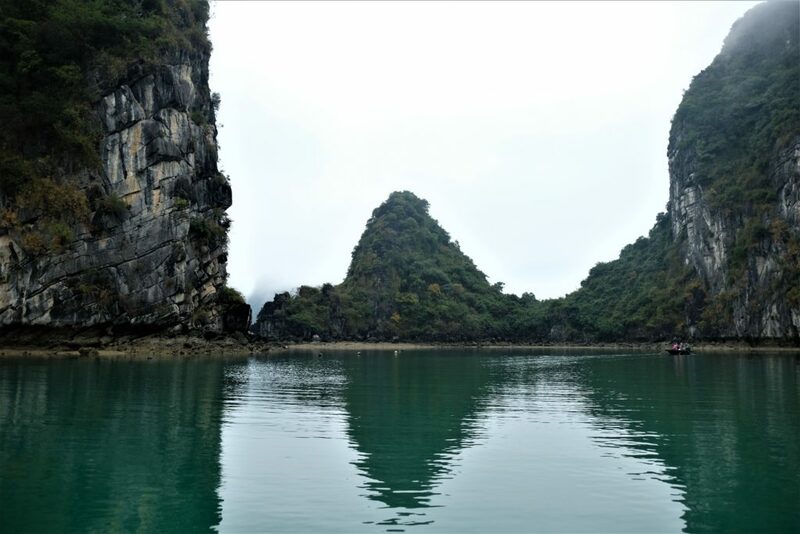 The myth about these islands is that they were created by dragons sent to help the Vietnamese against invaders. 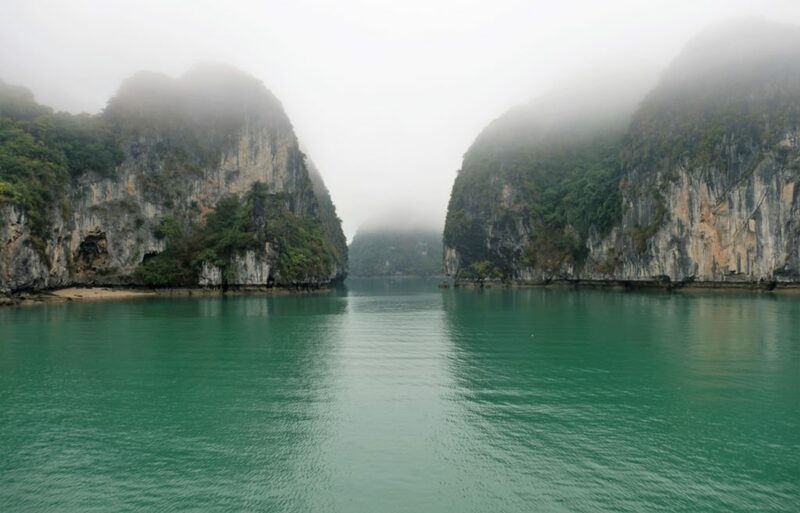 The dragons spat out jewels of jade into the bay which turned into the islands creating a barrier to protect the Vietnamese against invaders. Cave 2, that’s what I’ll call it was much bigger than the Master Cave, but still nothing to write home about. We only spend a few minutes there then headed back to our boat. 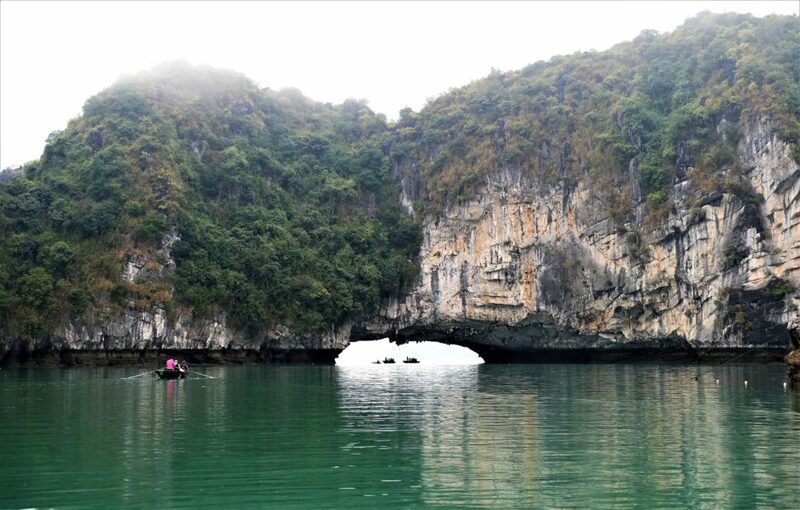 Kayaking to the cave and back I didn’t see a single marine animal, I couldn’t get an answer from our guide, the only rationale I can think of is either over fishing &/or pollution. The latter doesn’t make sense because the water was very clear yet still not a single fish, hmmmmm! 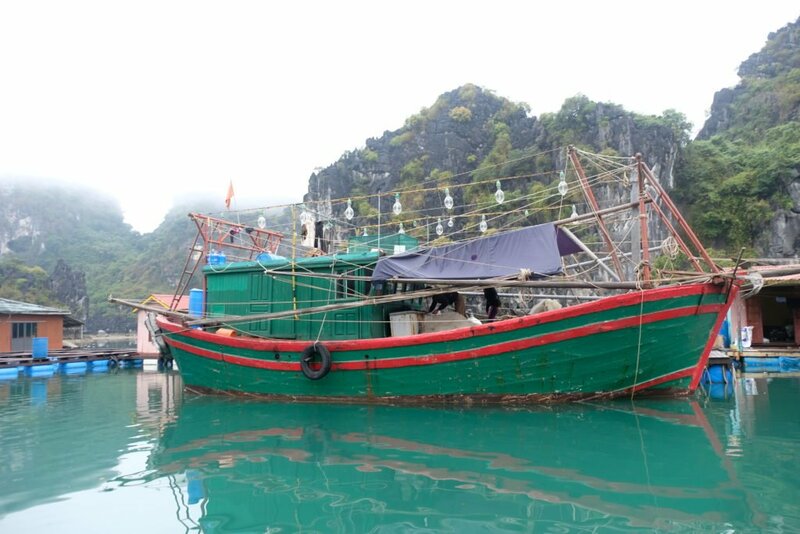 The rest of the day would normally be for chilling &/or swimming where we had anchored in Vung Ha, not today!!! I would have needed a fully body wet suit to go swimming, maybe not even then, so for the rest of the afternoon the 6 of us (we were joint by an Australia couple from another cruise) relaxed on the deck taking in the scenery around use (with out fleeces on!). 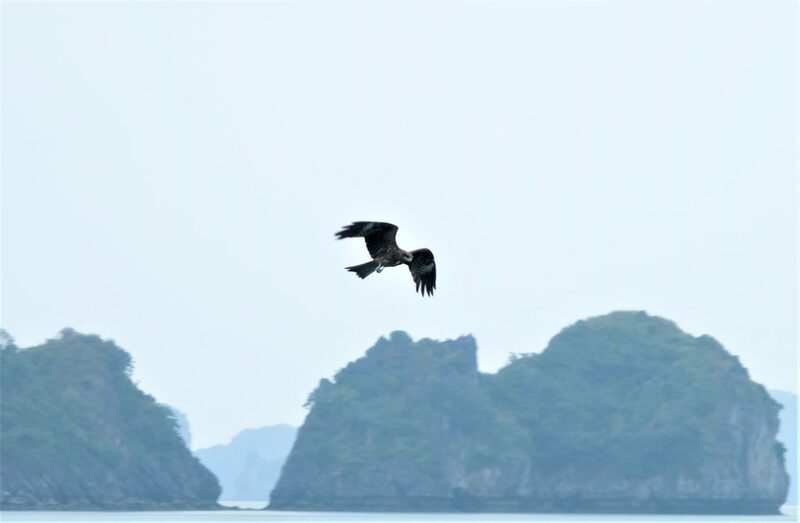 Oh yes, there were a couple of Black Kites flying near the boat, a little to far for my lens to get a good pick – added to that every time the cam close to the boat, I mean flew right above the boat I didn’t have my camera ready! I actually got a shot of it catching a fish and flying off with it, but the resolution wasn’t good….so I guess there must be some fish in the bay! We headed back to our mother ship which was near the pearl farm. Our skipper on our day boat was a little too excited to get us back and bottomed out the boat on the sea bed! A little toing and froing for 15 minutes with the engine heaving and spewing diesel smoke he managed to set the boat free and we disembarked back to our mother ship. Another evening of drink on deck followed by being over fed on delicious Vietnamese food. It was a relaxing and enjoyable day. 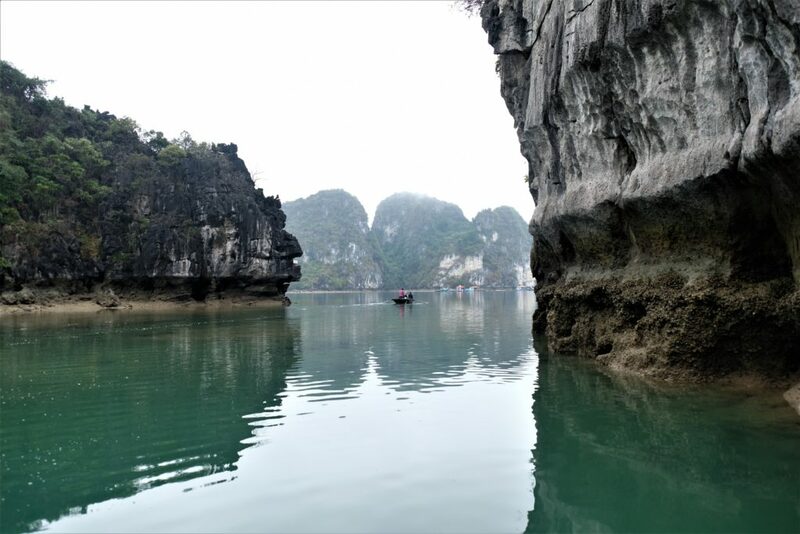 Making full circle after kayaking in Vung Ha, headed back to the pearl farm…just before our captain grounded us! 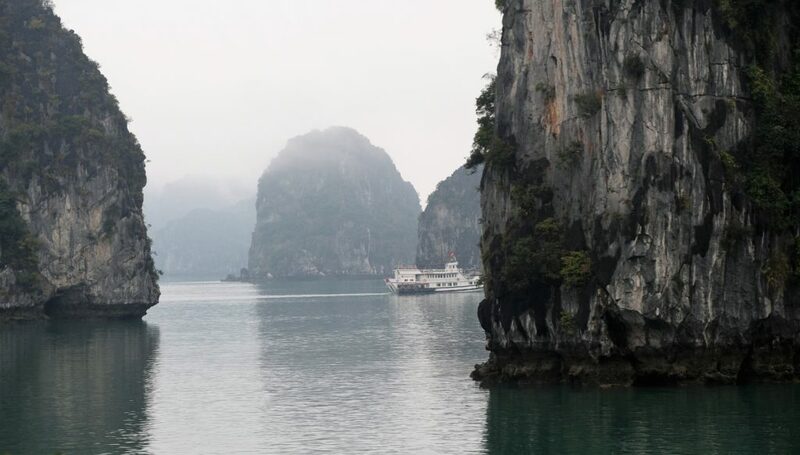 It the last day of our Bai Tu Long cruise, the weather had still not abated but there is nothing one can do about it. 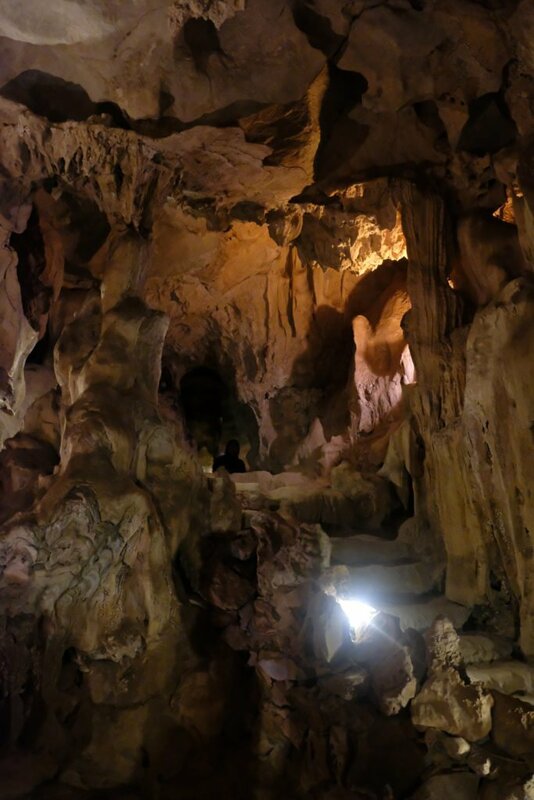 After breakfast we headed out on the day boat t visit Thien Canh Son cave, this was the biggest and by far the most attractive cave compared to the other two. 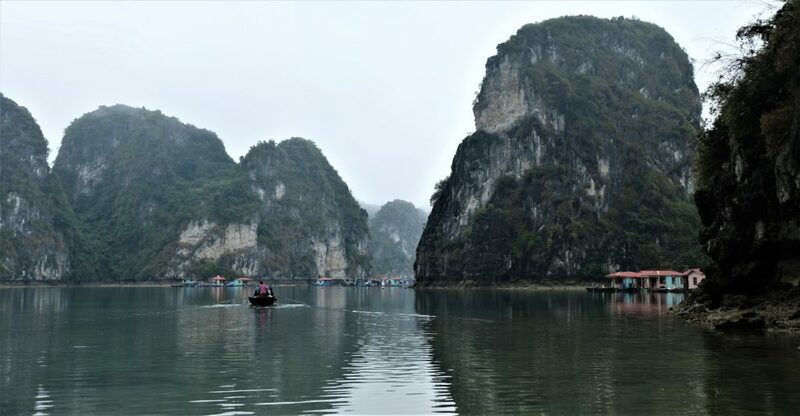 A congregation of other boats had arrived at the same time meaning there was a 20 queue at the entrance, well managed though; they gave each group enough time to see the cave without packing it full like a nightclub. Mila was feeling much better and looked it too. 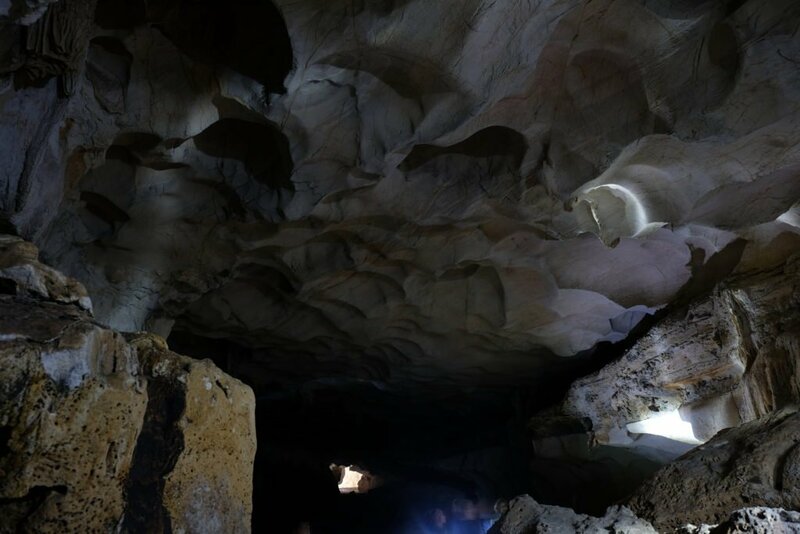 I was lucky enough to get a few pics of the cave inside almost void of people, a large cavern like a school hall in length and width. Our mother ship was waiting for us, a late morning (we had already checked-out of our rooms) cooking lesson on making traditional Vietnamese spring rolls was followed by lunch, whilst we made our way back through Ha Long Bay to Hon Gai International harbour – from there we transferred back to our little bus to take us back to Hanoi. We needed to get back to Hanoi on time to catch a flight to Hoi An, about half way down Vietnam on the coast. Flight was at 19:45 from Noi Bai in Hanoi to Da Nang, we hoped to arrive in Hanoi at 16:45 but got there with more than enough time. Ah, so a perfect segue way to say my next stop would be Hoi An! 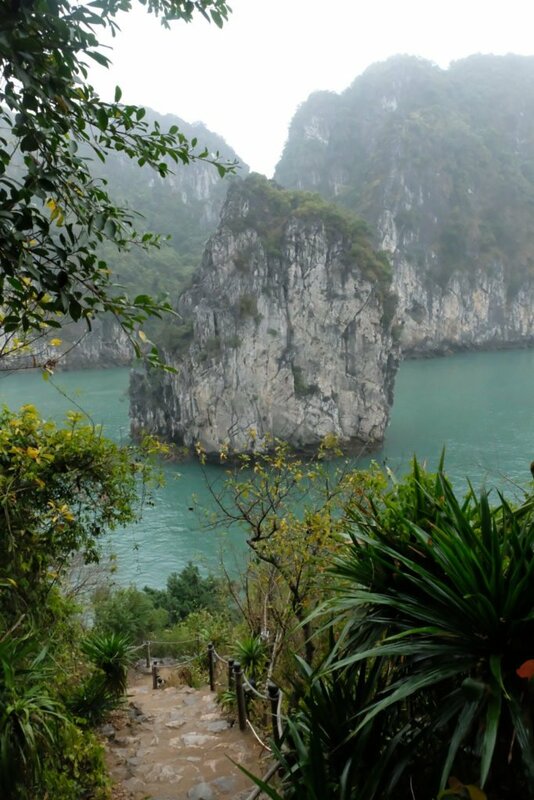 I’ve struggle like no end to get this post out, sure I’ve had a few interruptions with my routine (visiting my brother and sister-in-law in New Zealand) and many others but they are no excuse for brain freeze and a lack of motivation – so not the best of posts in my opinion, nor has it done Ha Long Bay and Bai Tu Long justice. For anyone reading I will do better next time!!! The cruise was great, a combination of relaxation and being constantly surrounded by stunning fairy-tale scenery. Of course, it would have been great if the clouds cleared, on a pristine day the views must be out of this world. 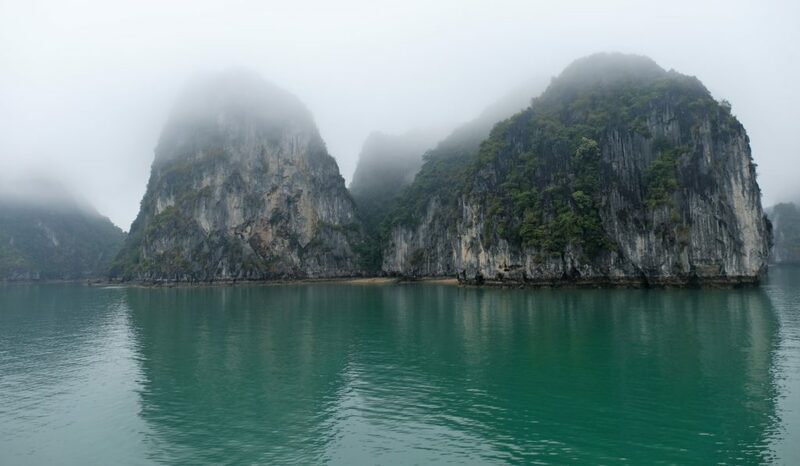 Maybe I should take another view, maybe the fog was the remnants of the smoke from the dragons drifting along the water to mystify and disorientate us invading tourists ?